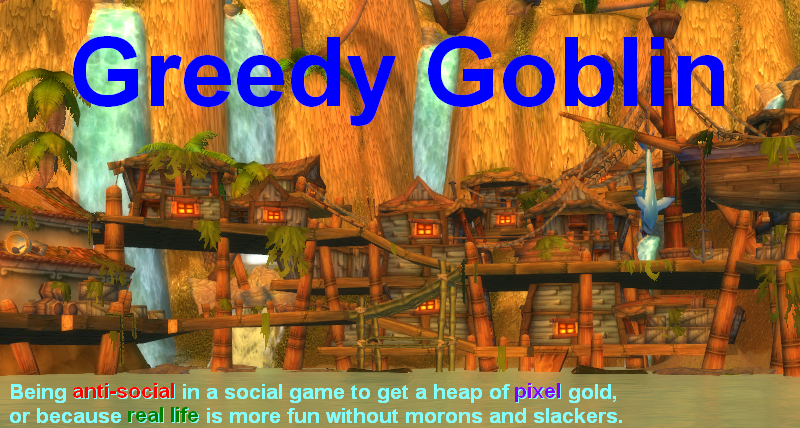 Greedy goblin: Cowardly little pets, DIE! A week ago RvB abandoned the Lemmings vs Goons war, despite we hit POCOs. Cowardly little pets, how could you leave your master in peril?! Of course it's obvious what's going on, RvB needs to regenerate after the heavy losses of the 2 months of war, so they can return into the service of the Goons with full strength. I won't wait for that! Hopefully Blue join in protection of Red. If not, we'll just slaughter Red, as Blue pilots won't see us war targets, so don't switch to purple mode when we enter grid, but keep shooting Red, side by side with Lemmings. As I wrote, the only way RvB can get away from us is openly declaring that they will never ever wardec anyone or join as ally into any war (except Red joining for Blue or back). RvB either returns to be Red versus Blue, or dies! External wars are good for one thing: serving Goons! Flaw in plan: If both red and blue don't already have your corp set -10 anyway, thus negating much of your plan, I'd be shocked. Setting someone -10 doesn't give you wartarget icon. Nor you can shoot without being concorded. They won't be able to shoot, but Red alone can handle lemmings, and blues can go suspect in T1 logis and rep them. You've stated previously that RvB was your main obstacle stopping your from taking Goon POCOS. We've been out of your way for a week. I could argue with you why we stepped back (I know why we did, but you won't believe me, so there is no point). But from a "boots on the ground" perspective, the why isn't that important, the important part for you is that we are out of your way. ... why haven't you taken out the Goon POCOs by now? Why is General Lemmings talking about taking fleets of interceptors to Goon space? It's not rational to drag us back in the war if our presence is what was causing you such difficulties in the first place. @LR: wait until Monday with that logic. It's factually wrong, but I don't want to publish the fact yet. If RvB fights, they're "Goon Pets". If RvB doesn't fight, they "need[s] to regenerate". Nice little self-reinforcing bit of circular reasoning you've got there. And the only way to prove you wrong is to make an open-ended commitment that no high-sec alliance with half a brain would ever make, limiting their alliance management options not just now, or a month from now, but potentially ten, even fifteen years from now. "Setting someone -10 doesn't give you wartarget icon. Nor you can shoot without being concorded." Indeed, but it does rather lessen the whole "And blue will keep shooting along with us!" idea. Any good RvB overview will have Blues (or reds) show up as one color based on the -5 standing, with war targets as -10. Given it is standings based, even if Blue's do not dec lemmings, they will know you are on the field. RvB has experience dealing with that from back when there was no ally system, and one side had to wait out the stasis period before being able to join in the fight. Also, if RvB were truly goon pets created or taken over to fend off groups like Marmite, why wouldn't goons just donate funds/material so there would be no down time for RvB to regenerate? It could be done anonymously, or in some manner not to arouse suspicion of line members, especially considering if your theories are true, goons have been running rvb for 2-4 years without it slipping out to anyone till now. So why would goons not fund RvB in some way to keep up RvB's supposes purpose of fighting goon's hi sec wars? Should you be thanking Gevlon for giving you things to shoot in highsec (or fun as previous posters called it) rather than questioning the reason behind it? It also allows you to forfill your function in highsec which is to defend goon assets rather than get diverted on other stuff. "So why would goons not fund RvB in some way to keep up RvB's supposes purpose of fighting goon's hi sec wars?" Because it's cheaper for Goons to allow RvB some time to regenerate and then order them to defend assets again. RvB have time to reenter war if POCOs are reinforced, or they will take them back if they miss the timer, given Lemmings are not big enough yet to hold and defend POCOs. Because it's cheaper for Goons to allow RvB some time to regenerate and then order them to defend assets again. Iif RvB were a CONDI deniable asset, they'd have a small knot of completely legit-looking industrial corps set up and taking the credit for a generous SRP wallet. For crying out loud, Mittens just announced that every pilot in Waffe will get double reimbursement on any PVP ship lost. 'Cheaper' isn't really something CONDI stresses over too much. @Gevlon - you really need to get a spare alt into RvB, read the forums and corp mails. There's no background check or interviews or anything to get into RvB - just apply and wait to be accepted. Now, if you'd actually done that - you'd know the real reason why RvB didn't renew last week. Unfortunately due to circumstances beyond our control those plans fell through. Is it only Lemmings, or is Marmite deccing Red also? RvB are here to stay. The fact is no matter what you, Marmites, Lemmings do, they are going to stay because of the way they operate. They are not your typical lemming high sec corp that have a central economic system that can be crippled (like you suggest in your several posts). Most RvB operations are self funded - people do it for kicks, resources not reimbursed. To shut down RvB members income would require you to track down every members income source and shut it down (impossible). They are not like your typical highsec mining / mission corp. It is also impossible to shutdown their recruiting process simply because of their unique operation - they are always in demand by new players. In addition any attempt to "damage" RvB is futile. Do you really expect anything you do can truly "hurt" them, when their members join this corp to get their own stuff blown up (literally)? Lemmings / Marmites are just more things for them to shoot at. All your posts of the demise of RvB are just your own mind trying to justify an impossible goal - the demise of RvB / Goons. Keep trying. I'm pretty sure the more you post here the less RvB is appealing to new players. Fact is: If you are unable to shut down a corporation's main mode of operation, such as their income and new recruits - the corporation will stay forever. If you really want to hurt RvB, the only way to do it is to prevent the main thing they do. Red-vs-Blue. If you can ever stop red from fighting blue, I assure you RvB will fall apart. Good luck! @Blue member: the statistic are clear: about 200B ISK (and decreasing) is spent on RvB by the members. They simply can't spend more (if they weren't poor and casual, they'd be in a serious PvP alliance). Exceed this and RvB crumbles.